By Peter Anderson 8 Comments - The content of this website often contains affiliate links and I may be compensated if you buy through those links (at no cost to you!). Learn more about how we make money. Last edited December 2, 2016 . 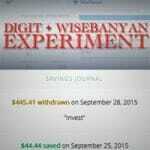 In October I published my most recent update in what I call “The Digit + WiseBanyan Experiment”. Since February has come and gone I thought this might be a good time to do my review of the experiment after 1 year – to see just how much I was able to save, and invest, over that time. The series of posts was designed to show just how easy it can be to save and invest using today's free and automated saving and investing solutions. 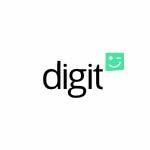 The first account was an free online savings account from Digit, an account that helps take the busy work out of saving. It analyzes your checking account daily and at regular intervals it saves small amounts of money from your checking and puts it into your Digit savings account – without your intervention. It allows you to save money, a little bit at a time, without even realizing it. The second account is a free automated investment adviser from the folks at WiseBanyan. When you have an investment account from WiseBanyan, their system will allow you to regularly invest in a taxable or tax advantaged retirement account, and it will automatically invest your funds in a portfolio of low cost ETF index funds. It's a great new long term investing site, along the lines of Betterment or Wealthfront, but without any account management costs. Digit and WiseBanyan are both big on the idea of automating things in order to make them more efficient, more cost effective and better for your bottom line. I liked the idea behind both sites, and after signing up, a year ago I decided to take both services on a trial run, and to run an experiment. Just how much could I save automatically for the year using Digit's tools? How much would I be able to invest at no cost using WiseBanyan? How much intervention would I need to have – and just how much could I save over time? First, let's take a brief look at these two accounts. So how does Digit work? You sign up for an account, and link your checking account. Digit will then analyze your income and expenses, find patterns and then find small amounts that it can set aside for you – without any pain for you. So once you sign up and turn on auto-savings, every 2 or 3 days Digit will transfer some money from your checking to your savings, usually somewhere between $5-$50. Digit won't overdraft your account, and they have a “no overdraft guarantee that states they'll pay any overdraft fees if they accidentally overdraft your account. WiseBanyan's founders understood that one of the drags on the typical person's portfolios is the fees that they're paying to invest, as well as the friction point of having to invest thousands of dollars to start. They changed that with no minimums to invest, and no fees charged for investing. WiseBanyan will be releasing some premium add-on products for their users, which they will charge for, but a basic investing account will not cost anything beyond the mutual fund expense ratios associated with your investments. What do you invest in with WiseBanyan? WiseBanyan will invest your funds based on Modern Portfolio Theory (MPT). Your investments will be diversified, low cost and recognize the value of long term passive investing by investing in ETF index funds. Plus, when you sign up now, you'll get a $20 Signup Bonus! Open Your WiseBanyan Investing Account and Get A $20 Bonus! So for my Digit + WiseBanyan Experiment, the goal was not only to take these two free products for a spin, but also to show just how easy (and low cost) it can be to invest. There really should be no excuse to not get started. When I started in February 2015 my goal was to allow Digit to automatically pull money from my checking account and put it into my Digit savings. Whenever the amount in my Digit savings reached $75 or more I would transfer that money over to my WiseBanyan account and invest it in their highly diversified set of ETF index funds. Why was I doing it this way? I did it this way because WiseBanyan has no minimums and you can buy fractional shares, so why not? I can transfer money in small chunks, and engage in a bit of dollar cost averaging while I'm at it. So how are things going now that I've been doing the experiment for an entire year? Let's take a look. After setting up my Digit and WiseBanyan accounts I put the plan in action and allowed my Digit account to start saving on my behalf. 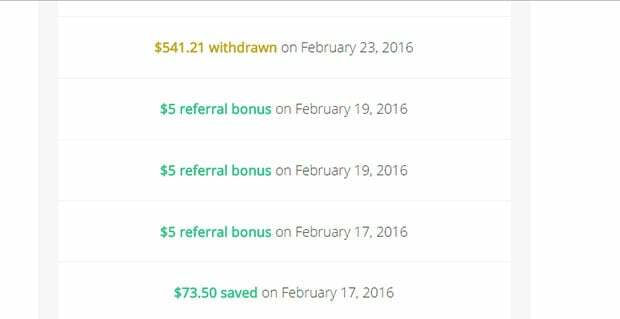 Digit started saving small amounts in my account when I first began. $5 here, $15 there. Over time multiple transfers and deposits ended up adding up to larger amounts in my Digit account. My first transfer to my investment account was about $186. From then on every time the amount reached around $75-$100 or more, I transfered the money to WiseBanyan. I'm now just over 1 year into my little experiment, and I've withdrawn my Digit savings balance and invested it in my WiseBanyan Roth IRA 25 times. Here's a screenshot from my Digit account showing my latest $541.21 withdrawal for the purpose of investing. After withdrawing the money I then transfer it from my checking account over to WiseBanyan. Deposits can be used to purchase fractional shares of the ETF index funds used in the account. I currently have $3298.83 invested at WiseBanyan, from the $3347.68 I have deposited. The investments (and the markets) have gone down about 1.5% since I started, so that accounts for the losses. Here's my portfolio's asset allocation in my WiseBanyan account. It is a bit more aggressive than in my other retirement accounts. We'll see what kind of returns my account sees over the coming months/years, but I'm sure it will be close to what the market does. Since I'm not paying any account management fees to invest, I'll be coming out ahead as compared to some other automated investment advisers. So how has the experiment gone now that I've made it an entire year? In my book it's been a rousing success. I've saved $4538.55 over the 12 month period via Digit. If we divide that over 12 months, it means an average saved of about $378.21/month. 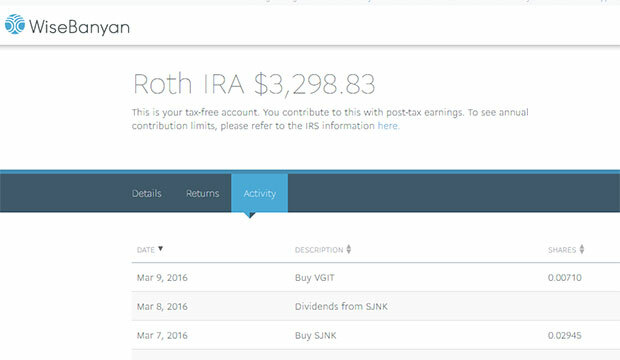 If you look at that $4538 amount, it's about 83% of the annual $5500 contribution limit for a Roth IRA. So essentially, almost all of my year's Roth IRA contributions are happening without me having to actually think about it. The money is slowly coming out of my accounts – usually in amounts that don't even really register. The savings amounts tend to be in the $10-50 range, although a few have been $100+. It's amazing how fast those small amounts really add up! Let's say you were in your 20s and you were to do something similar to what I'm doing with this experiment. You could end up with a pretty nice start to your nest egg over time. Just setup automated savings and investments, and in my case that $4538 contribution for the year when extrapolated out over 30 years at an average 8% interest, will end up as just over $567,300 over 30 years. To me that's the power of long term investing. You can take small savings and investment amounts like this, and make it grow. In the end those small amounts end up adding up to a large lump sum in retirement. That's pretty powerful. Why not get started now? 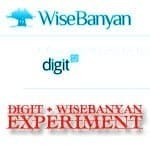 Interested in joining the “Digit and WiseBanyan Experiment” for year 2? I invite you to join in! After your accounts are open, sit back and wait for the savings to pile up – then invest! Piece of cake! Give it a shot and let us know how it goes! 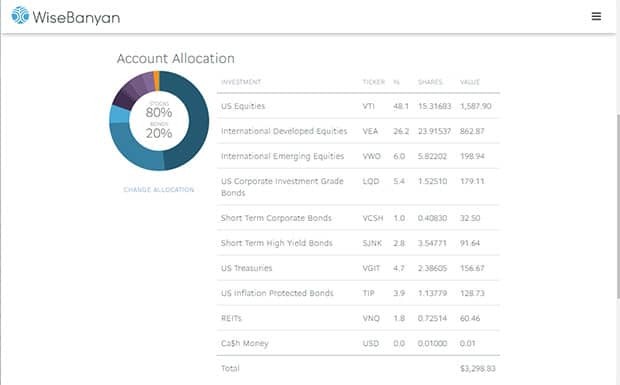 How much can you invest automatically when you save money using a Digit savings account, and invest with an automated investment advisor like WiseBanyan? Last Edited: 2nd December 2016 The content of biblemoneymatters.com is for general information purposes only and does not constitute professional advice. Visitors to biblemoneymatters.com should not act upon the content or information without first seeking appropriate professional advice. In accordance with the latest FTC guidelines, we declare that we have a financial relationship with every company mentioned on this site. I like the concept of Digit, but from my understanding you can’t tell it to leave a certain cushion in the bank. I personally always keep at least $5,000 in my checking account, and would hate to see Digit transfer over a large chunk of money because I wasn’t using it. Ideally I could tell Digit to “zero” my account at $5,000 and only transfer unused funds above that level. I LOVE how simple Digit is to increase savings though,e specially for people who know and truly think they are incapable of saving money. You’re right, there’s no way to set an account balance floor not to save below, and I agree that would be a nice feature to have. There is, however, the ability to pause the auto-saving whenever you want, so you could in theory just unpause the saving when you know the amount in your account is above a certain threshold. Hopefully they’ll add a feature like that in the future. I know another product, Betterment, has a feature like that where you set a floor and it only saves for you if your balance is above that amount. May be something to check out. Great Article Peter! I haven’t tried Digit before but Wisebanyan is great. I personally prefer automatic transfers (monthly or weekly) that I can setup myself but I still admire the idea of digit. Really cool way to save! Fantastic experiment, and a nice post. Thank you for sharing the details. As I mentioned on Twitter, a direct connection between Digit and WiseBanyan would make it very easy for customers. Great post Peter! I’m getting into the realm where I need to start setting something up like this. I’m doing some research now and plan to post on my findings and experiments as well. Thanks for posting this and being transparent with your numbers. Peter, I initially thought about using Digit to train my brain on building good habits. My intention was to try and beat Digit’s savings pace, and to also move my money into a high-interest savings account (so I earn the interest, not Digit). I thought that would work well, and I wrote about it at https://medium.com/@daspitzberg/un-automating-savings-bd2e7ccfc65b#.3xt4eehug … but now, I simply set up automatic transfers from my checking to my savings account, using my online banking service. That means I get 100% of the interest that Digit would otherwise earn. What do you think? From your experience, am I missing something?